This tree portrait represents an experiment with “focus”. 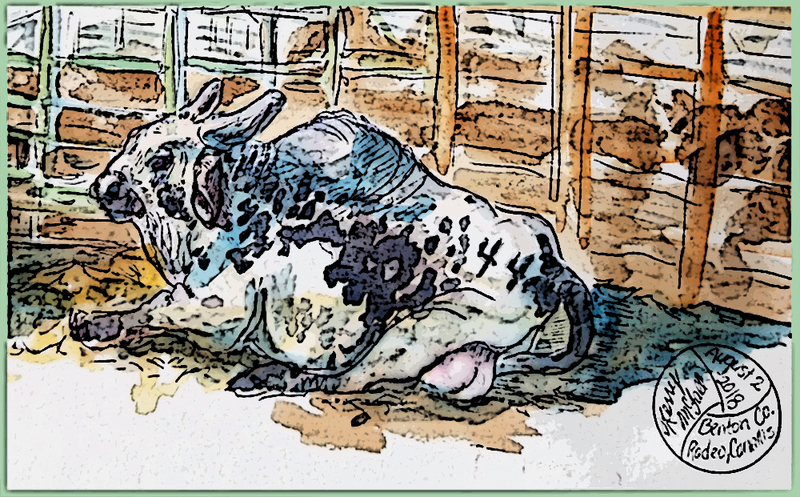 Inside the enlargement, I used both opaque watercolor and transparent watercolor initially, then highlighted using a brush pen. I blurred the background branch by scribbling over it with white china marker, and I drew over the outline of the foreground branch and blooms with the marker also. Then I added a blue transparent wash over the entire background, which fuzzed things up quite nicely. A few touchups with transparent watercolor and .03 Pitt Artist’s Pen, then I added the quick sketch of the entire tree as it appears outside my kitchen window. The final touch was to spatter pink paint from a toothbrush on the blossoms – next time I think I’ll use thicker, brighter spatters. Sunday was a blustery day so the petals are now scattered all over the neighborhood. In another few days, they’ll be soggy, brown memories of their former pink glory. Time marches on. 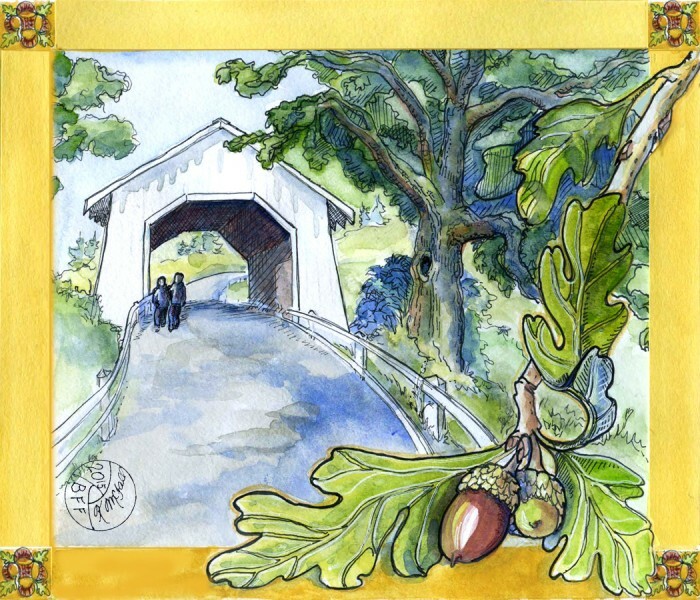 This entry was posted in Works and tagged art technique, colored pencil sketches, Corvallis artists, drawings, Nature drawings, Oregon, sketch journal, sketches, spring art, tulip trees, tulips, Willamette Valley on March 17, 2015 by Kerry McFall. This is another piece from the Call and Response show, perhaps my favorite this year, painted last spring (2014). I saw this broken but still beautiful branch on an ancient tree behind the homestead at Finley Wildlife Refuge, hanging on by a thread of bark and a bit of wood. The blossoms and bee are cutouts, made from watercolor, ink, and gel pen. The background is a collage of various papers and paints. The “float” frame makes it possible to position the cutouts into a 3-D setting. I am amazed at how quickly spring is barreling in to the Willamette Valley right now… the honeybees seem to be having a hard time keeping up. So many flowers, so few bees. I noticed this morning that strawberries, blueberries, and pears are blooming in my front garden – WAY early! The little Fuji apple tree is a bit behind because some butthead college kid tore off the best fruiting branch one night in the wee hours in January … grrr… I scrounged around in the garage and found an old can of pruning tar to seal the wound. (Tip: wet coffee grounds are very useful for scrubbing pruning tar off your hands and arms. Also nail polish remover.) Apparently they had a go at uprooting it as well, but with a little luck and a few bungee cords… I hope the tree lives. And, I hope he/they (yep, pretty sure it was males) woke up with MAJOR headaches. This entry was posted in Works and tagged apple blossoms art, apples, Call and Response, Corvallis artists, early spring, Finley Wildlife Refuge, florals, gardening, Kerry McFall, McFall, Nature drawings, Oregon, sketch journal, sketches, Willamette Valley on March 14, 2015 by Kerry McFall. To say I was not immediately struck by inspiration would be an understatement. My prompt for this year’s Call and Response* exhibit was “Quiet, Noisy.” How in the world could I put the sense of hearing on a flat surface with paint? How to translate audio into visual? But soon enough, I was assaulted by the answer: I happened to be driving near the Portland Airport when a military plane took off from PDX and the afterburner kicked in… it was deafening. I decided to contrast that with the silent flight of a hawk, often seen soaring over the fields as we drive up and down the Willamette valley. Once I started getting ready to paint, the reality of a triptych dawned: I have no place to paint big enough to allow me to work on three canvases at once, which I would have to do to keep the colors consistent. So, down to one canvas, which would be simpler anyway, but sticking with the window arch idea… maybe making the entire piece a “window” done as if it were leaded glass? Next came the jet, which interestingly enough was called a “raptor” according to my Google research. Hmm… possible title? The underlying glass bits, which I had outlined in ink markers, bled through, even through several layers of thick gesso. This “pentimento” became echoes of the jet con trail. The jet and the bird are also going in opposite directions, both facing off the canvas, but the con trail(s) and furrows in the field below curve back to the center of the painting, the conflict of the quiet and the noisy. Coincidence? Works for me! Carolyn Kindell, my neighbor, is an avid birder, and she shared several bird books to ponder for reference. I learned that hawks glide over fields listening intently for mice and voles moving underground… as a “hidden Mickey” kind of a joke, I had already added a tiny field mouse in the grass beneath the hawk. 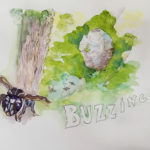 When she saw the work in progress, (she’s my neighbor and a frequent visitor, impossible to keep it secret), Carolyn said “The mouse lives another day, but the hawk goes hungry.” And possibly the hawk goes profoundly deaf, after the afterburner event. I decided that the mouse needed a bigger role, so I detailed in his little home entry and made him more obvious. Finished 2/12/2014. The painting is now hanging in La Sells Stewart gallery on the OSU campus, surrounded by the responses of our seven Call & Response member artists, plus three guest artists. I am thrilled with their responses. If you’re in Corvallis, please take the opportunity to see how these artists chose to respond to my call. It’s free! 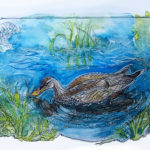 *Call and Response is a community art exhibit created by eight Willamette Valley artists. This is our fifth exhibit. The C&R theme for 2014/15, was “Opposites”. We each pulled a “prompt” slip of paper out of a hat, which contained two words that were the opposite of each other. The painting that resulted from this prompt would be my “call” to seven other artists, one at a time, who would respond with a work of their own based on mine. They would not know the words of my prompt, and they would not see the other artists’ responses; they all just knew that we were working with opposites. 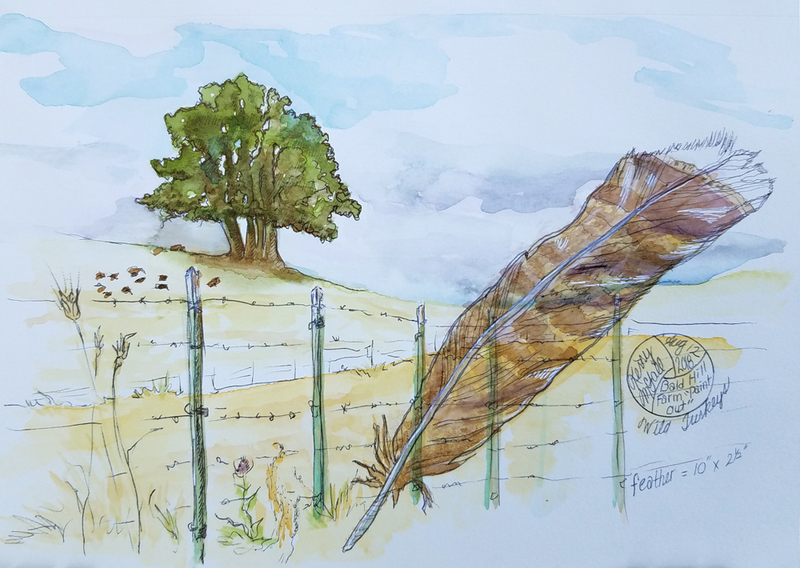 This entry was posted in Works and tagged birds, Call and Response, community art exhibit, Corvallis artists, Kerry McFall, Nature drawings, Oregon, raptor, sketch, sketch journal, Willamette Valley on January 29, 2015 by Kerry McFall.